North Carolina Republican Gov. Pat McCrory extorts Charlotte over HB2. North Carolina Republican Gov. Pat McCrory, the state’s most passionate spokesman for HB2, its anti-LGBTQ law, has had an almost comically terrible week. Not because he’s tanking in the polls—although he is—but because his efforts to reverse his slow-motion collapse have failed so completely. Let’s examine the top three lowlights of the governor’s last seven days. 1. McCrory plants friendly questions at a Q-and-A and falsely attributes them to a real newspaper. At a lunch event last Thursday, McCrory took questions from the audience. 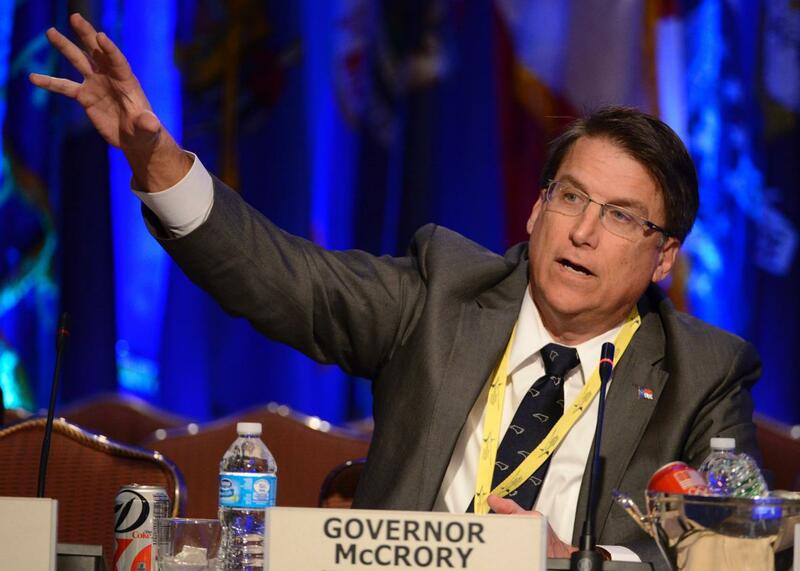 When the moderator asked how to conduct the Q-and-A, McCrory declared: “Anything you like. No filter here.” The moderator promptly reeled off three questions, stating that they were submitted by the Charlotte Observer. But the questions were not actually submitted by the Charlotte Observer. In reality, they were written by McCrory’s staff, total softballs that invited McCrory to bash his gubernatorial opponent and praise his own vision for the state’s future. When he was finished answering the questions his own staff had penned, an actual Observer reporter attempted to ask a real question. Of course, the Observer quickly uncovered the truth behind the mischief—and learned that McCrory’s staff had also misled the event organizers by insisting that all pre-screened questions had come from the Observer or the audience. 2. McCrory tries—and fails—to extort Charlotte into repealing its LGBTQ nondiscrimination ordinance. McCrory urged his Republican-dominated legislature to pass HB2 after the Charlotte City Council passed a basic LGBTQ nondiscrimination measure. That, in fact, was HB2’s primary purpose: to repeal Charlotte’s ordinance and ensure that no city could ever create legal protections for gay, bisexual, and trans North Carolinians. On Friday, McCrory attempted to use HB2 as leverage to extort Charlotte into repealing its ordinance, which is still on the books but remains legally unenforceable due to HB2. His office announced that McCrory would even call legislators into a special session to repeal HB2 almost immediately if Charlotte repeals its own measure. 3. McCrory withdraws his lawsuit against the feds before a court has the chance to quash it. In May, the Department of Justice asked North Carolina to confirm that it would not enforce HB2 in a manner that violated federal civil rights law. Instead of responding, McCrory sued the feds, asking a judge to declare that North Carolina has a right to discriminate against trans people. This maneuver allows McCrory’s lawyers to focus their energy on the actual HB2 court battle rather than his political sideshow. They are currently losing that battle—much like McCrory himself is losing the campaign to rehabilitate his own tarnished image in time for the election. The clock is ticking; McCrory’s favorability ratings are plummeting; and he cannot afford another week as bad as this one. Indeed, the political fortunes of a once-rising star already appear to be irreversibly on the wane, thanks to the toxically unpopular law upon which he chose to stake his career.